Easy-IP is a simple and easily navigable software solution that delivers centralized management of IP addresses and other network resources across the enterprise. Using a Windows-based management interface, Easy-IP simplifies the planning, organization and control of your entire IP Address space. Easy-IP helps you monitor network changes by using a powerful auto-discovery tool with SNMP, to maintain an accurate, up-to-date inventory for all your subnets, IP Addresses and network devices. With an intuitive Web-based GUI, the database can be accessed by multiple administrators in diverse geographical locations - from any web browser. 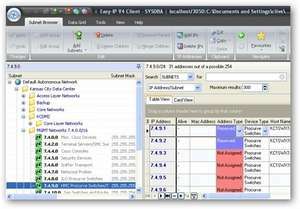 For security reasons, you should also check out the Easy-IP download at LO4D.com which includes virus and malware tests. Additional screenshots of this application download may be available, too.